Happy Christmas! But maybe not for Michaelia Cash, with this takedown based on her cringeworthy August CFA interview with David Speers coming in #8 on the list of IA's most read stories for 2016. IA's new crash scene investigation unit forensically uncovers what went wrong in Senator Michaelia Cash's excruciating interview with David Speers on Sky News. IN AN INTERVIEW described by observers as both “excruciating” and "a trainwreck”, Federal Employment Minister Senator Michaelia Crash … sorry … Cash, got herself into a dreadful tangle on Monday (22/8/16) trying to explain the need for new laws to regulate Victorian firefighters. Always here to help, Independent Australia’s Forensic Crash Unit has studied the gory, debris strewn accident scene left by Cash and Sky News host David Speers, and is now able to explain exactly how it all happened. One of the few bright spots in the Coalition’s dismal election campaign was Malcolm Turnbull rallying with Country Fire Authority (CFA) volunteers and staff in Victoria. Administrators of the CFA were then up-in-arms about a new enterprise bargaining agreement, which was said to put more power into the hands of the United Firefighters Union. Turnbull said he would legislate to prevent this from happening and this anti-union posturing played well in the Murdoch media, possibly saving the Liberals at least one seat in Victoria. Having promised to deliver this legislation and despite doubts about its constitutionality, Senator Michaelia Cash came onto Sky News' PM Agenda to spruik its credentials. 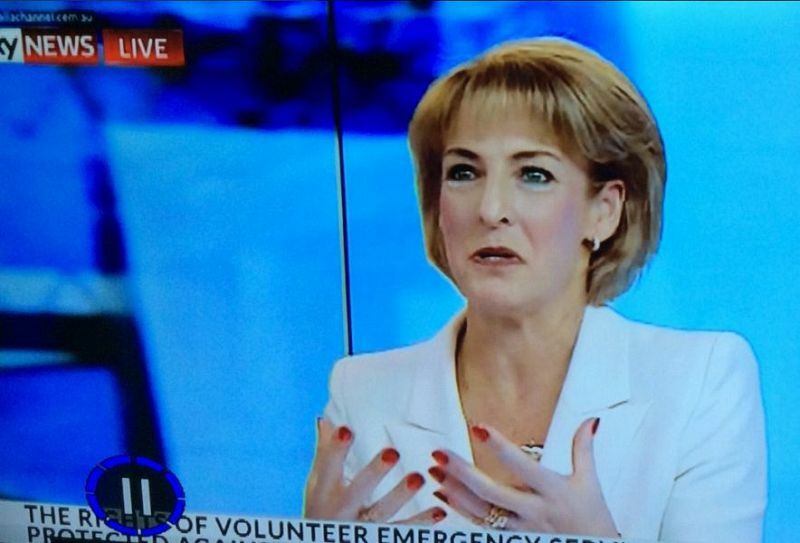 Observing Michaelia Cash navigate a media appearance is always a testing experience. Made famous through a screeching, clawing Senate speech many likened to her being “possessed by the devil”, and with a speaking voice described variously as “Kath and Kim”, “fingernails on a chalkboard” and “Barina pulling a caravan up a hill”, Cash consistently begins behind the eight-ball with the hearing-able public. Moreover, David Speers has a history of tripping up Federal ministers. He made a fool of Bill Shorten during the Gillard years (whatever she says! ), and his celebrated “metadata” interview with George Brandis probably still has “Soapy” wincing when he hears the offending term. So, Cash may have been apprehensive even before taking her seat across from Speers in the Sky studios on Monday afternoon. As you might expect, Cash began the interview awkwardly. After an elongated introduction, Speers greeted the senator, to which Cash responded with a sort of vertical Nazi salute. This suggested poor media advice. Some things are better left in the party room. Then Speers asked why the legislation was necessary. Cash responded with the forceful eye-contact, exaggerated enunciation and energetic hand movements of someone earnestly trying to provide a general outline of quantum mechanics to the household Labrador. After detailing a few basic talking points, Cash then went to the legislation itself. “This is it,” she said, proudly waving a thin document in the air to show to Speers, visible yellow highlighter and all. Unfortunately, though, things were just about to get a whole lot thicker. 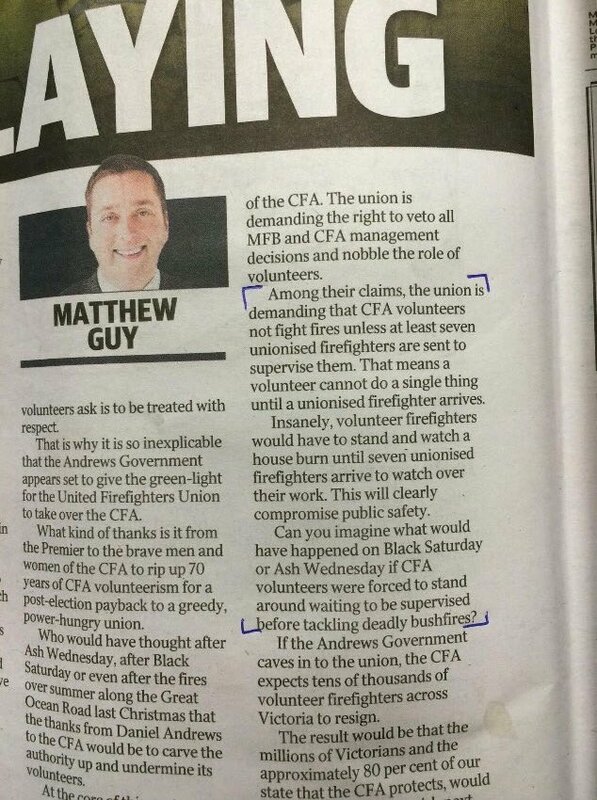 Speers asks Cash, reasonably, how the Victorian firies enterprise bargaining agreement “undermined” the CFA volunteers, necessitating the need for new legislation. Yes, this is the main sticking point, agrees Speers, but what does it really mean? “Well, there are differing interpretations,” replies Cash. “But what’s your interpretation of it,” Speers asks. Cash does not explain why the car fire needs to be put out twice, nor, indeed, how the vehicle miraculously reignites like a novelty candle. But what are "safe firefighter operations", asks Speers? Cash, apparently a practicing lawyer before entering politics, flicks through the document aimlessly. “Well, I can’t find it at all within this agreement,” she replies, pointing down at it with both hands, as if casting a hex on its progenitors. It was here that Speers finally forced Cash off the road and into an ironbark on the side of the highway. This unexpectedly good legal work from the faithful Labrador causes immediate panic from Cash, whose gesticulations turn from frenetic to frenzied. “Well, when you actually read this agreement, a number of the clauses intersect and it’s certainly being raised by…” babbles Cash. “Have you read the agreement now,” Speers interrupts. “Well I have the agreement in front of me,” gestures Cash, unnecessarily. Speers looks unconvinced, but allows Cash to continue. It’s a fundamental change, she bleats! “Well, can the chief fire officer at the CFA also not be wrong, because he says this proposed agreement won’t affect his ability to direct the fire,” asks Speers. Sirens can now be heard in the distance, as Cash brings up other officials to support her argument. Speers helpfully agrees there are “differing interpretations”. Cash thinks Speers is about to assist her, but then notices he is holding a jerry can. Ah yes, we all know this legal argument. It’s the vibe, your honour! And it is now, in the interests of good taste, with Speers patiently and relentlessly posing the same obvious question ‒ why is this legislation needed ‒ and Cash chittering about the brevity of the legislation, and chattering on about how she has spoken to hundreds, nay, thousands of volunteers, including someone called Don – all of whom, apparently, "can't be wrong" – that we draw a discreet veil over the remainder of this unfortunate incident. The good news is that after the flames were extinguished ‒ twice, as per regulations ‒ and the jaws of life administered, Cash was able to be successfully pulled from the smoking wreck. Yes, she suffered severe third degree burns and the effects of inhalation, and is now said to be in a serious but stable condition — but with a full six year term in the Senate in front of her, she is expected to make a near full recovery. And with drivers like this behind the wheel, the IA Forensic Crash Scene Unit expects to have a lot of work to do in this term of Parliament. You may watch the full interview below — if you dare! Follow managing editor Dave Donovan on Twitter @davrosz. All I'll say about Michaelia Cash's interview with Speers is that I can see why both she and Brandis gave up practicing law to try politics. Independent Australia supporters and members can also listen to managing editor Dave Donovan in his weekly podcasts in IA's Member's Only Area. If you are not an IA subscriber but would like to access all the extras, please click HERE. Don't worry. Subscribe to IA for just $5 a month (or less).